GPS Live Tracking Notifications Theft Protection Fuel Management Dispatch System Surveillance Charts & Reports Maintenance Points of Interest Trips/ Task Mgt. Fleet Analytics Reputation Mgt. Real time position updates in every 5-10 seconds providing you with the latest tracking information on your fleet. Google Maps - No hassles of potential lawsuits; sunrise tracking uses licensed Google Maps API for commercial purposes. Easy to use GPS vehicle tracking platform that can hold any no. of vehicles; no complications or uncertainties. Track your assets remotely now in real time every inch of the way and gain control over your fleet. No longer do you need to bother about the complications behind the working principle of GPS vehicle tracking. Monitor daily use of your fleet/freight resources, reduce your fuel waste and ensure on-schedule transport & on-time delivery. Can be day/time based : Alerts can be made active for specific times & days depending on your requirements. Can be sent to Multiple Recipients : All notification alerts can be sent to multiple recipients. Available as report : Detailed report of all generated alerts is available within the application itself in 'Analytics' module. Let's face it, it's a fact that you are never off from worries regarding your fleet at operations. Get notified immediately on vehicle abnormalities, schedule violations, theft attempts, mechanical warnings & failures, irresponsible/careless driving techniques and even more. Avoid illegal usage of your vehicles now by assigning work areas/routes for vehicles. Park fencing : Forms an automatic fence around your vehicle once it's parked; alert you when vehicle goes out of fence. 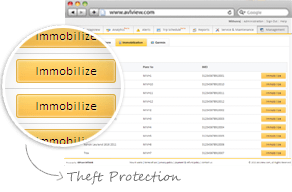 Immobilization : Immobilize/Stop your vehicle remotely using sunrise tracking; recover your stolen vehicles with ease in no time. iButton & RFID : 1 wire protocol for driver identification; prevent unauthorized vehicle use/theft. History : Animated History available for upto 6 months; where-all your vehicle has gone and stopped and for how long etc. A GPS tracking receiver with anti-theft features that doesn't even cost 1/100th of your vehicle cost. 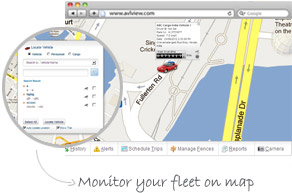 Track down your vehicle easily with sunrise tracking's advanced FMS features. Fuel Level Detection : Identifies fuel level at all times; displayed in real time along with other parameters on map. Fuel theft/fraud protection : Identify fuel refilling & draining spots (with time stamps) and get hold of fuel theft/fraud. Monitoring Fuel Consumption : Measure actual fuel consumption of your vehicles and identify average mileage. 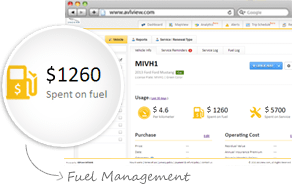 Fuel Forecast : With the available metrics & analytic reports, forecast the quantity of fuel required for your future trips. Hiking fuel prices & losing economy, sudden death of business enterprises where competitions heading to a peak; do you need any more reason to use a real time GPS vehicle tracking system to manage your fleet? With sunrise tracking, keep your eyes as of an eagle on fuel consumption of each vehicle. Keep monitoring real time fuel tank levels, fuel purchased vs actual fuel and the fuel consumption; save upto 20% in fuel every year. Two way messaging : Two way text communication between you and driver; each message can be upto 128 characters. Real time Tracking & Navigation : You can do your fleet monitoring & drivers can navigate easily avoiding time lags. Scheduled Stoppages : Schedule stops in advance; notify drivers on proximity, you get notified on the stoppage (entry/exit). Canned Messages : Archived messages; 200 messages stored directly on Garmin devices; 120 stored responses for drivers. You now can keep in touch with your drivers; send priority messages to drivers or send delivery/pickup point. 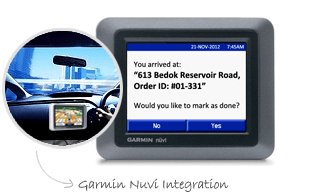 Connect GPS vehicle tracking device via an interface toolkit to a Garmin Personal Navigation Device (PND) in each vehicle; your drivers can now receive/send messages on fingertips; makes real-time navigation and job dispatch capabilities more efficient. Still Camera : Click snaps automatically in definite time periods and then sends them across to the application. Voice Surveillance : You can even monitor conversations happening with in vehicle; 2-way voice communication available. Panic Button : Driver/passenger can press buzzer if he smells danger; initiates an instant panic message to you. In today's struggling economy, having the ability to not only track your vehicle, but also ride along with your driver is essential. 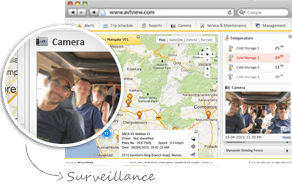 Be it for the safety of passengers or your valuable assets, sunrise tracking's In-Vehicle Surveillance module, a part of fleet management system; send continuous & frequent updates about events happening with in vehicle. Time Based : Choose a timeframe (for eg: 14th Feb – 14th Mar) and request for a chart/report to analyze vehicle usage. Points on Map : Click on the line of data on report; you can see the exact location of incident (eg: over speed)on map. Asset wise/Consolidated : Choose the way you wish to receive the report; asset-wise or consolidated. Alert Log : You missed a couple of alerts on phone/email, no worries; consolidated report available with all alerts. Brief yet informative & useful charts and reports that allow you to track activity over time to get a better understanding of your fleet. sunrise tracking FMS offers 11 charts and nearly 40 concise reports over 100 parameters (speed, time, ignition, fuel, distance) with nearly 100 statistics done; you have all the information you need at your fingertips to make smart decisions business decisions in least time. Schedule Service : Default list of all periodic services available, you can add a new service or edit an existing one. Service Alerts : Set service reminders based on period/mileage/odometer; alerts received as SMS, email or both. Service History : An e-log of all your so-far completed services; know when exactly and what exactly was done. Service Reports : Detailed reports on all completed service/maintenances; reference for future. With our Service and maintenance module, you will not forget a maintenance session or miss a periodical service/renewal. Upload all POI's : Feed all your POI's with their lat, long values to an excel worksheet and load all your Points of Interest on a go. Search & Find : You can even search a spot on Google maps and add as POI without even having to know lat/long values. Adding individual POI's : If you already have the co-ordinates, simply feed it; immediately reflected on map. 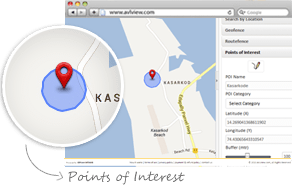 Reduced Location Errors : All POI's are created with a buffered value(eg:100m) to minimize error in spotting exact location. Delivery points, warehouses, bus stops, service centers or whatever they are, you can now map your business points on your Google Map using sunrise tracking. You can even set alerts to notify you when a vehicle enters or leaves a point. Add as much as POI's as you wish to; no limits, all with sunrise tracking. Drop a pin on your desired location, name it and save it, easy & straight-forward. Time based Management : Assign your vehicles/personnel with a timetable to follow; daily/weekly/monthly schedules. Calendar View : A quick look on the calendar is what required to understand your fleet schedule for a month. Route fence Integration : Route fence can be added to scheduled trip/task; verify if drivers follow delivery schedules. Alerts by SMS/email : Notification alerts for early/late departures, early/late arrivals and route fences (if assigned). Advanced routing and scheduling rules help drivers steer traffic and swiftly identify the best order to visit multiple stops and waypoints. Utilization charts/reports : Overview on fleet utilization/underutilization ratio based on Hours, distance, cost, trips etc. Operation cost chart : Block by block representation on fleet operation costs; Insurance, Wages, Maintenance etc. 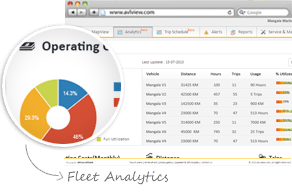 Consolidated Data : Fleet Analytics is available for individual vehicles as well as in a consolidated form (all vehicles). Driver Scorecard : Ratings for drivers based on driving skills; assign best drivers for responsible tasks/reputed clients. No longer do you have to sit with tons of documents on fuel consumed, distance travelled, time taken, idling and anything & everything related to fleet management to calculate operations cost. 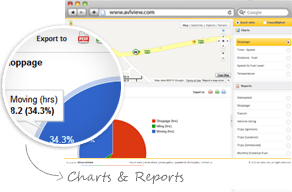 It's all right in front of you in the forms of charts & graphs; take a glance and know what's happening with your fleet. Decision making in fleet management has never been easier before. Company Reliability : Your clients will be more impressed with the added security that you offer with your fleet services. Incredible Service : Pre-scheduled services and timely deliveries would gain your clients more value than ever. Credibility : Trust, the core factor of any business would be your ultimate advantage over competitors. Sound Reputation : Your company will build up and possess the brand name in your field providing incredible service. Will the GPS Tracking Solution and GPS Tracking Solution Provider help you improve your trust rate with your clients and in the industry? Will having such a GPS tracking System boost your reputation into being a more reliable service/commodity provider? Of course Yes, with all these modules/features included in sunrise tracking, your market stakes are going to be high.